Mhoroi Gumiguru! | Hello October! Gumiguru | (Shona word) October | Goo-me-goo-roo. What memories, activities or individuals does October remind you of? I know in the Northern parts of the world that this the time of the year you all wax lyrical about pumpkins, the onset of Fall and cute ways to wrap a scarf around your neck (my IG timeline can currently testify to that). 1. First things first (I am the realest, lol). And to keep it 100, I will kick this off by mentioning the biggest event that marks this calendar month…yes people, it’s the day that commemorates my auspicious arrival onto this green and blue planet. (read: You have T-minus 10 days to get your acts together and shower me with pressies). 2. The first offenders of “Yes, it’s too darn early to be advertising anything to do with Christmas” make themselves known in October. I don’t know why I still get surprised when I walk into a store and they have the Christmas trees and fairy lights out in full force. 3. Now is the time to stock-up on your sunscreen of choice because The Sun, she is bright and intense right about now. That one-arm sun tan you get from driving around ain’t cute, and skin cancer is very real (no matter how much melanin you think you’re packing). Get on your SPF 30 – 50 game, folks. That’s my public service announcement for the month, lol. 4. Jacarandas are in full bloom beautifying many a city centre and having hay-fever sufferers (like me) at their mercy. Ooooh fun fact, did you know that Jacarandas are a South American import and that in quite a few cities around the world they are banned because of how much water their pesky tap roots chow from local water tables. 5. I share my birthday month with many a notable personality but one of my favourite characters is Aubrey Graham (Drake, to the rest of you plebs). He has done us October babies proud, even starting a record label called October’s Very Own (OVO). So it may be pure coincidence, but his tracks get played a lot more by me during this time of the year. On constant rotation right now: “Hotline Bling”. 6. My annual quest to find a Halloween party without being accused of actively seeking out and entertaining “madhemoni” is underway. My people (African people, to be exact), Halloween is seriously not a devil-worshiping day. It’s just a great time of the year to play dress-up, wear a questionable amount of make-up and channel your favourite character from Games of Throne. May this year be as good to me and bring me a cool shindig to attend. Ha-men. 7. I would say that this is the time of the year that it starts raining but since Climate Change took up residence, it’s anyone’s guess as to when a substantial amount of precipitation will make its appearance from nimbostratus clouds strewn against the sky. 8. The more diligent and strategic amongst us, who have been working out over the last few months, get to debut their swimsuit approved bodies at this time of the year. The rest of us instead, receive threatening messages from friends on how we are starting that horrendous-but-guarantees-results workout regime to not shame ourselves by the pool. Personally, I have perfected the “Shuffle to the edge of the pool, drop sarong and descend into the water before anyone sees anything” routine over the years. When all else fails, I’ll just employ that. 9. Which brings me to the topic of the gym! I see you boo-boo’s, walking around in your gym wear, drinking from your fluorescent water bottles and bragging about how many burpees or crunches you’ve perfected in under 30 seconds. 10. Mosquitoes. Pesky, tenacious little critters that have you wearing mosquito repellent as your go-to “eau du toilette” for the summer. Seriously though, here’s hoping you have a productive, rewarding and enlightening month ahead of you. 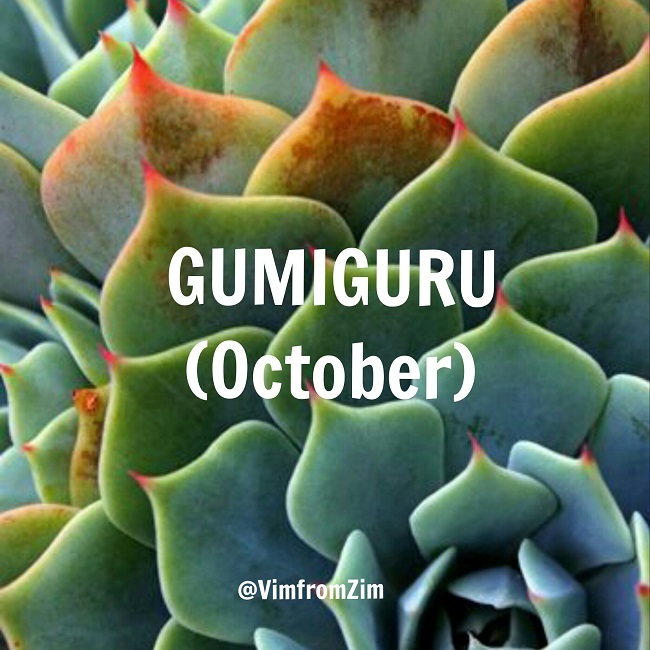 I loove Gumiguru for it’s meaning alone = BIG 10..unlike the Gregorian calendar where Oct means Eight (yes the insertion of January and February messed up the system but..#RandomRamblings). And so seeing your big ten my take away is 15th October and Mr Aubrey Drake Graham…I refuse to address him by his first name now because he demands respect, a man with such abs and muscle calls upon official recognition, I want to be a part of Mr Graham’s legal counsel and represent him in the both the board room and the..studio ..okay yeah digression…OCTOBER is a great month! PS: Tried to check your birthday wishlist.,.the way my innernets is set up..
Big 10, I love it. Makes October sound like the Notorious B.I.G. of all the calendar months, lol. I agree with you, Mr Aubrey Drake Graham demands our attention and respect *sips some Sprite*.